So, my intention for this project was to enter into the Paper Trey Ink Sampler Square Challenge. However, upon completing the project, I realized that I failed to use any PTI products. (Whoops!) So, I will just count this as my day 11 entry for the Daily Marker Color Challenge. Then I looked at it in terms of what I call "color groups" that I thought would blend together. I decided to do a Red, Yellow Red, and Yellow group; a Blue, Blue Violet and Violet group; and finally a Blue and Green group. I had intended to do a blue green with that group as well; but the only blue -green marker I have was too dark. I have no real method to my blending techniques...I just kept playing around and coloring each square until I was happy. I decided to just make this a front panel and not an actual card. Since it's a little larger, I may frame it and give it as a gift later. Ok, so that is all for me today. Have a great weekend and I'll see you all again soon! This was a super simple card as I had all the pieces from PTI's framed out set already cut sitting on my desk. So, all I needed to do was emboss the card front and emboss the sentiment with white embossing powder. A little white ribbon and some faux white stitching and finally adhering it with a little foam adhesive and this card was done. Confession: it may have taken me a little longer than 5 minutes to complete! Probably more like 10-15mins; but that's still pretty darn quick! 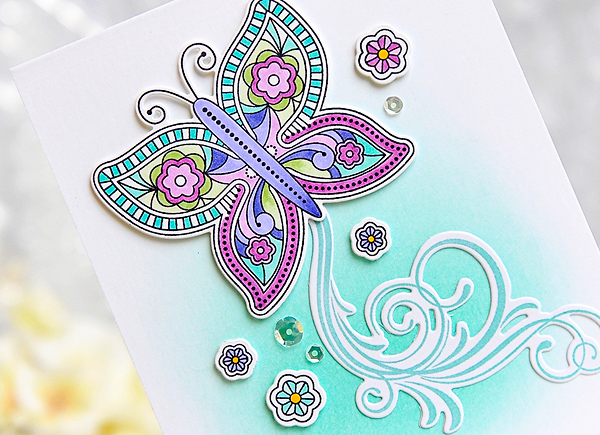 I do not have a lot of PTI stamps at the moment; so I wasn't able to use a butterfly: but I did find a way to use the "Framed Out 6 mini stamp set" I embossed the Circle Pattern background stamp from Hero Arts in white powder and then used distress inks to blend over the the top. I used Crushed Olive, Milled Lavender, Tumbled Glass, Cracked Pistachio and Seedless Preserves. The rest came together pretty much as it appears. That's all for me today. Have a great day! Thanks for visiting me today. I hope you are all doing well. I know the blog has been quiet the last couple of weeks; but I have been super busy in my crafting studio creating cards for the "Lasting Hearts Card Drive" which I now have boxed up and ready to mail out...as soon as the snow and Mother Nature cooperate long enough for me to get to the post office. I have also been participating in Kathy Racoosin's 30 Day color challenge. This is a new challenge for me and I really like how it is stretching my coloring muscles. I will not be posting those pictures here, however. If you would like to see what I've been making for that challenge, be sure to follow my Instagram page. Just click the IG icon over there on the right and it'll take you right too my page. It's just easier for me to snap a picture every day and post them over there. I do hope you're following me! I try to follow back as many as I can too. The other thing that has been occupying my crafting time these past few days, are the challenges for Paper Trey Ink's 9th anniversary celebration. Now, I have used PTI card stock for YEARS. It is my favorite card stock. I know there are so many other great companies out there that make outstanding card stock; but I just always keep coming back to PTI's Perfect Match card stock. What I've not had a lot of before are PTI stamps, so I was excited to order some "new to me" PTI items along with my re-supply order of card stock. So without further ado, here are the cards I have for Day 1 and Day 2. I will be working on day 3 and 4 today and tomorrow. Day 1: Choose a color recipe card and create a card, using at least one PTI project. I chose the recipe card with Pure Poppy, Raspberry Fizz, Scarlet Jewel, Ripe Avocado, Tropical Teal. I also used the "Brushed Off" set which I alternated across the bottom in black and embossed in white. For the top half of the card, I used the "Framed Out 1" mini stamp set along with the coordinating die. Day 2: Create a card inspired by a piece of clothing in your closet or online, using at least one PTI product. I chose this summer shirt I've had for a couple of years now. I love the colors in it, and I thought the "Brushed Off" stamp set was perfect for it. I can already tell, I'm going to LOVE this set. This card was super simple to make. I stamped the larger images across the left side of the card in Simon Says Stamp Soft Navy, Salty Ocean and then Mermaid Lagoon Distress inks. The smaller images on the right were stamped using alternating Crushed Olive and Peeled Paint Distress inks. The sentiment is from PTI's "Words of Comfort" stamp set. This is a great set to mix and match sentiments. I love the versatility of it. I added some foam adhesive to the back of each sentiment strip for a bit of dimension. I also added dimension to the back to the entire front panel before adhering it to some 110lb Neenah solar white card stock. That is all for me today. Thank you so much for visiting me! I'll be back tomorrow with more PTI challenge cards. Don't forget to click the Instgram button!